Сейчас Вы просматриваете программу, находящуюся в категории(ях): Офисный софт. Далее Вы сможете посмотреть полную новость программы, которой Вы заинтересовались. Для того, чтобы бесплатно скачать Wondershare PDFelement Pro 6.1.3.2390, прокрутите страницу вниз до окончания полной новости и перейдите по указанным ссылкам. Приятного Вам скачивания! Wondershare PDFelement Pro - программа для общего редактирования документов PDF формата, инструмент из серии все-в-одном. В функции редактирование входит поддержка изменения текста и шрифта. Реализована поддержка технологии OCR ( оптическое распознавание символов ), есть режим конвертирования документа в разные другие форматы, имеется поддержка добавления своих картинок в документ, можно нумеровать страницы, для быстрого перемещения в дальнейшем. Wondershare PDFelement может добавлять нужные вам формы на страницы документа, есть режим позволяющий соединить несколько документов в один, конечно не обошлось без возможности добавлять свои аннотации. При желании документ можно после вашего редактирования защитить паролем. Редкая фишка, но все же в Wondershare PDFelement тоже есть, цифровая подпись, которую вы сможете ставить на ваш документ. The all-in-one PDF solution for your growing business. Change the way you work with PDF. 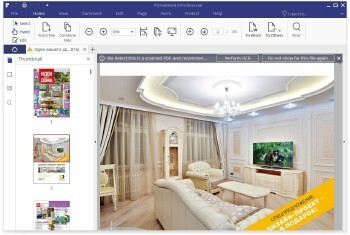 Wondershare PDFelement provides everything you need to make PDF workable. PDFelement is by far the best PDF editing solution. Edit With PDF element, alter text and change fonts as you do in Microsoft Suite. Simply click and start typing – it’s that easy. OCR Our top-of-the-line OCR (Optical Character Recognition) technology turns scanned documents into a fully editable document allowing you to: search, edit, format, resize, all text. Multiple languages supported including: English,Korean, Russian, German, Spanish, and many more. Convert Want to work on the document with other programs? Convert from and to PDF directly from Word, Excel, Image, and other popular file types. Add Image A picture is worth a thousand words. Simply insert an image to your PDF and rearrange the sizing appropriate to your document. Bates Numbering Working on a legal document and want an easy way of identification and retrieval? Place identifying numbers on each page to help index multiple pages for easy recognition and search. Form Creation Edit an existing form or create your own with customizable field options such as: text field, check box, radio button, combo box, list box, button, or a signature field. They are all interactive to make data collection or survey creation a breeze. Combine Have more than one file you want to combine? PDF element allow for the conversion of multiple files into one simple PDF for easy organization. Annotation Highlight important text with our highlighting tool or make sticky notes to communicate detailed information. Select from over 20 predefined stamps to help archive or customize your own to feature a specific area of the document. Password Protect We know some of your documents are sensitive and needs a layer of protection. Set restrictions for opening, copying, editing, and printing to make sure your files are safe even if they fall into the wrong hands. Signature Received an RFP or need to sign a contract? Use the provided industry-standard encrypted digital signatures or create one specifically for your handwritten signature. Redaction Some information are confidential and sensitive to the public eye. To avoid private information from getting out, the redaction tool offers the ability to permanently black out the text or image. What's new in version 6.0: - Brand-new re-designed user interface with better usability. - Added automated form field recognition and interactive form field creation. - New feature: You can now extract data from interactive PDF forms and export the data in the form fields in CSV format. You can also perform partial OCR on specific user-define fields in scanned PDFs, and export the digitalized data in CSV format. - Added Batch Process capability for convert, data extraction, add Bates numbers, and watermark. - Merged "edit text" and "edit object" status buttons into one. - Improved Find feature to quickly navigate through your documents. - Greatly improved the user experience with Save and Export features. - Simplified link setup, with new option to “open file” call-to-action. - Redesigned Page view for quick navigation, improved document reorganization, and access to Split and Extract tools. - Extensive improvements on many details.